I'm probably going to make a lot more of these. I hope you like it! Art and animation belong to me. Do not use them without my permission. To use this in comments just click add media and search up the name of this deviation or my username. If you want to use this as your avatar, ask me before you do, and don't forget to give me credit! p.s. It would be awesome if someone made this into a plz account! Please tell me if you do! Red Link is the CUTEST DAMN GUY EVER! can i use fore profile pic? Oh, you meant your avatar! by the way i love your art! i wish i knew how to animate things. Flipnote studio for the DSi is what I started animating with at first. 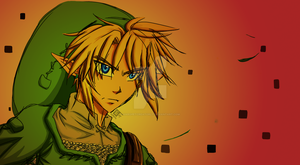 The Red Link Luv and some of the other icons I made where made using it. All of them r Awesome! Is it alright if I can use them as my avatar? Sure! As long as you credit me somewhere on your profile! But for some reason, I can't download it and use it! I've edited the deviation options temporarily, there should be a download option now! Please tell me once you've dowloaded it so I can change the settings back! Ok! I got it now! Did u changed it for the others too? No. I'd rather not have people downloading my icons without permission. The on titled "shadow link laugh"? Sure! I've edited it so you can download it now. Please tell me once you have done so. Unfortunately, thumbs don't work in comments, but you can still use this icon in your comments by clicking the '+ Add Media' button which normally appears at the bottom of the comment that you are typing. From there you can just search up the icon's title, Ex: Red Link Luv, or it's creator's username, Ex: HaropetcreatorLT. And then just click on the icon when you find it and it should appear in the comment! : AND IIIIIIIIIIIIIIII WILL ALWAYS LOVE YOUUUUUUUUU! Hello Love it by the way!! Just remember that next time you use one of my icons as an avatar, you must ask me first! Thank you for giving me credit though! You can use this as your icon, just give me credit! That would be cool! Omg I love this icon!